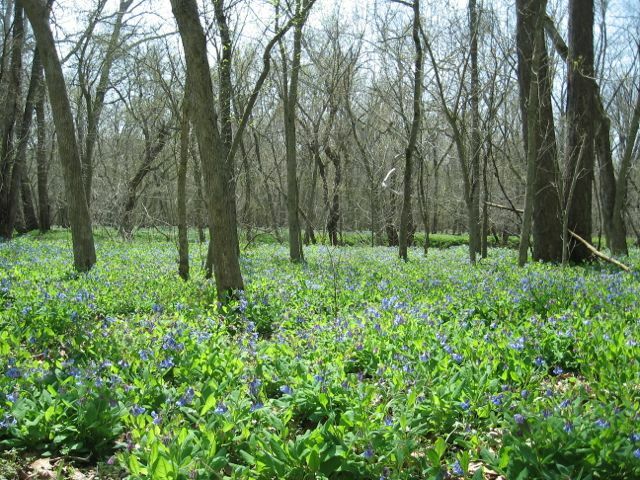 This site was registered for the large stand of Virginia bluebells and other spring wildflowers in the Cedar Run floodplain, and also for the upland forest community in the northern and western portions of the property. This forest is one of the best stands left in Prince William with high species diversity, low levels of deer browse, little human disturbance for 50-80 years and few invasive plants. A portion of the forest is classified as upland depressional forest, a fairly rare plant community type characterized by a perched water table and wet-tolerant species. OPEN. 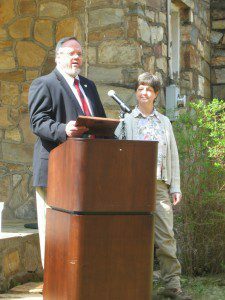 One of the most important roles the Virginia Native Plant Society can play as a conservation organization is to participate in local conservation and education efforts. The Prince William Wildflower Society (PWWS) got an opportunity to do just that in 2007 when members of the Prince William Conservation Alliance (PWCA) asked if PWWS could help do an initial assessment of a property being purchased in western Prince William County to become a new state wildlife management area. Merrimac in spring, a great place to see bluebellsMerrimac Farm was a privately owned 300 acre property adjacent to Quantico Marine Corps Base. PWCA was working with the property owners, the Virginia Department of Game and Inland Fisheries (VDGIF) and the United States Marine Corps to purchase the land for public use and to buffer the Marine Corps base. The property had not been a farm for many years, so there were no open crop fields or pastures. Instead, Merrimac Farm had meadow and old field habitat, upland forest and bottomland forest communities. Attention was quickly drawn to the bottomland forest along Cedar Run which has a large stand of Virginia bluebells (Mertensia virginica) along with floodplain tree species such as American elm (Ulmus americana) and swamp chestnut oak (Quercus michauxii) and has since become the focal point for spring wildflower walks. High-quality shrub wetlands elevated just above the Cedar Run floodplain host buttonbush (Cephalanthus occidentalis), arrowwood viburnum (Viburnum dentatum) and turtlehead (Chelone glabra). The meadow area in the central part of the property has several good quality native warm season grass stands dominated by Indian grass (Sorghastrum nutans) and hosts many wildflowers including closed gentian (Gentiana clausa) and clammy cuphea (Cuphea petiolata). The big surprise came in the upland forest areas. Merrimac Farm has a good quality oak-hickory forest which displays good overall structure likely because of continued deer hunting in this rural part of the county. Plant species include not only common overstory trees, but fringe tree (Chionanthus virginicus) and shining clubmoss (Lycopodium lucidulum). 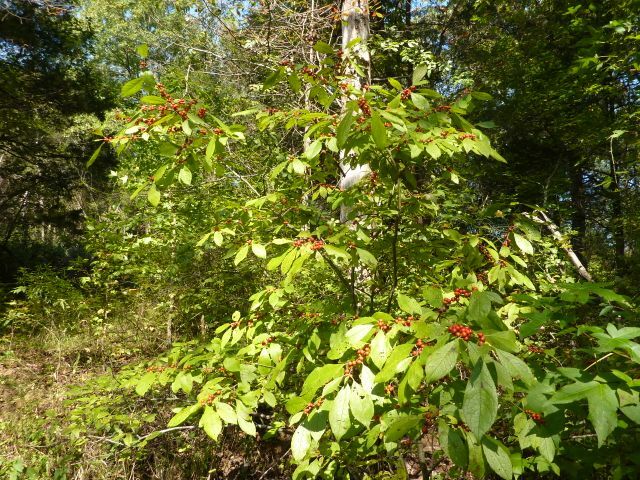 One of the most unique plant communities is upland depression swamp forest dominated by pin oak (Quercus palustris), winterberry holly (Ilex verticillata) and several sedges (Carex spp.). This unusual wetland community type exemplifies the great diversity of communities that sparked the initiative to make Merrimac Farm a VNPS registry site. Educational and research efforts continue at Merrimac Farm. Led by the PWCA in coordination with VDGIF, Merrimac Farm is the home of the Prince William Master Naturalists program. This year VNPS members will work with VDGIF staff to collect further data to catalog and map the site plant communities.